Bewildering, convoluted, unreadable. 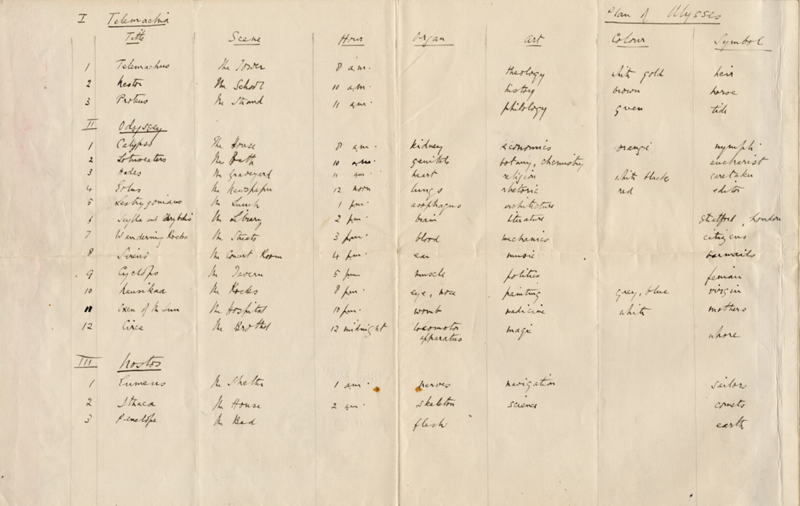 These are just a few of the adjectives that can be (un)fairly applied, upon first exposure, to both James Joyce’s Ulysses and the above data visualization. Representing the entirety of the #YearOfUlysses Twitter conversation, this visualization will form the nexus of a print volume that compiles, commemorates, and records the Modernist Versions Project’s “Year of Ulysses.” As one can imagine, “porting” a year-long Twitter discussion into print poses considerable design challenges—not least of which being how to accessibly represent the networked synchronicity of the former in the diachronic linearity of the latter. While I could circumvent such challenges by simply mining Twitter for content while ignoring the platform’s formal complexity (as some recent projects have done), I want to eschew such approaches, especially given the modernist sensibilities that inform #YoU. By highlighting Twitter’s form and content equally in my collation of #YoU, I am interrogating the ways that social media can inform or supplement our reading experience of Ulysses. However, as I’ve suggested above, it is simply not feasible to replicate the entirety of #YoU while simultaneously providing an accessible entry into #YoU as a whole. This tension between #YoU and its print representation necessitates significant editorial engagement on my part, and I’ve been struggling to formulate a framework that simultaneously justifies my editorial decisions while addressing my concerns about the representations of Twitter conversations. Perhaps unsurprisingly, I’ve turned to the good book of Ulysses to inform my methodology (as any Joycean worth their salt would). 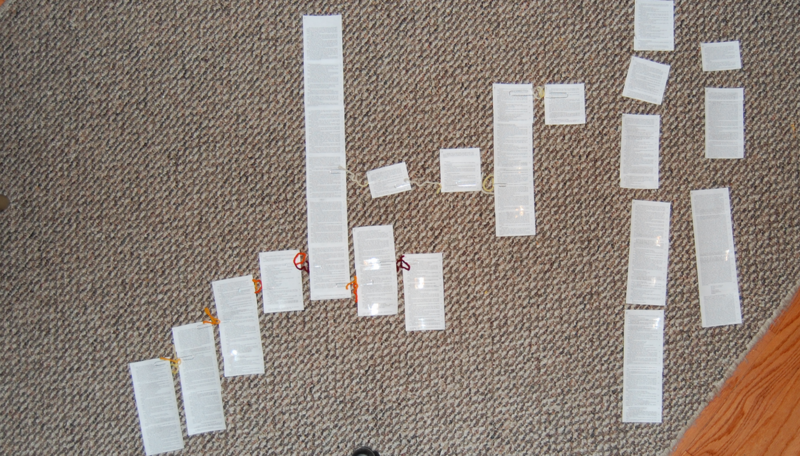 In short, I plan on editing and structuring the #YoU data according to the very same formal techniques that Joyce foregrounded within Ulysses. In my explicit use of such techniques, I seek to demonstrate the ongoing relevance of Joycean techniques in conceptualizing contemporary social media. 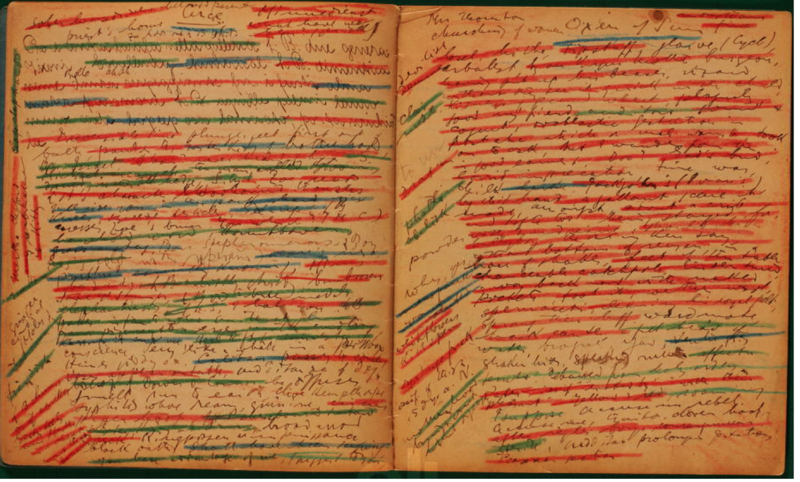 While I lack the space to explicate Joyce’s notebook as represented above, each highlight signifies a phrase, word, or passage that Joyce transferred from his notebook into his manuscript, while each colour accords to a different draft. 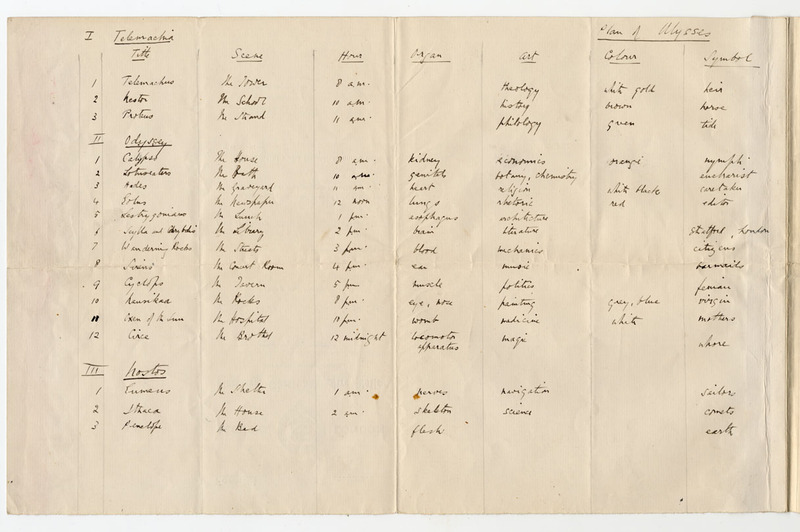 Importantly, what is represented here is not a linear narrative, but fragments that Joyce wrote down for (possible) future use in Ulysses. As such, Joyce’s notebooks contained a sort of bolus of textual material that would be arranged into a unified narrative. In conceiving of myself as another “scissors and paste man,” and my editorial relationship with #YoU in the same way, it goes without saying I do not claim equality in either authorial or textual skill, only that I justify my editorial engagement on an aesthetic, Joycean level as well as a pragmatic one. Each layer of density corresponds to a Twitter chat, which in turn examined or discussed a specific episode. Therefore, not only can #YoU be understood as thematically episodic; it demands to be schematized as temporally episodic as well. As such, the #YoU data can be made to correspond with Joyce’s own schemas—down to such “design” concerns as colour and form—a coincidence that I seek to exploit in constraining the “enormous complexity” of #YoU. And like Forster, I plan on applying Joyce’s techniques to the print edition of #YoU in an attempt to represent Twitter’s hairball complexity. By applying the Joycean notion of the arranger, schemas, and labyrinthian simultaneity, I hope to demonstrate the continued relevance of Ulysses to contemporary social networks. While I look forward to testing the applicability of these techniques, such an approach inverts my original intention to interrogate the ways which contemporary social media help us understand Ulysses. Instead, it gestures towards the way Ulysses helps us understand, or at least conceptualize, contemporary social media. Post by Stefan Krecsy, in the YearOfUly category, with the versioning tag. Twitter visualization produced using TAGS. Images for this post care of Stefan Krecsy, Philip Maltman, The Rowley Gallery, Chris Forster, and the collection of Harriet Shaw Weaver (1922). See also, James Joyce, Selected Letters. Ed. Richard Ellman. London: Faber and Faber, 1975.